Here’s what we think are some of the best bars and clubs in Dubrovnik to really get the party going! Ahh, Buza Bar – probably the most famous, “secret” place in town! This legendary place is accessed by going through a doorway on the southern side of the Old Town walls – make your own way round to the southernmost street of the Old Town and you should eventually find a sign saying “Cold Drinks”. If you do, you’re in the right spot! Set amongst the rocks beyond the Old Town walls, this cafe/bar has a number of narrow levels. Find any free table and sit yourself down – you’ll soon get attended to by the quick staff. Get a beer or a glass of wine and look out to sea to watch the boats sail by. The best time of day to come – unsurprisingly – is around sunset. Everyone else has the same idea, of course, so try and turn up a little early! In a square with what seems like a million and one bars (…slight exaggeration!) you’ll find this gem in one corner. With plenty of seating outdoors (and barely any inside) the biggest draw of this place is the live music each night. Park up at any of the small tables – all of which already have chairs pointing towards the musicians – and take in the great music. Piano and double bass seem to be the two instrumental mainstays; some of the waiters also seem to join in on some songs on drums or bongo! Good range of standard drinks and cocktails too. 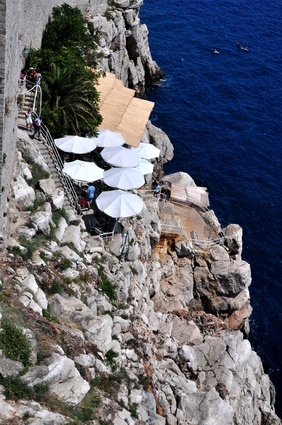 Where one of Dubrovnik’s most famous upmarket restaurants – Gil’s Restaurant – once stood comes this venture, opened in 2012. Upstairs at Gil’s was once Gil’s Pop Lounge, but the new restaurant’s cocktail bar doesn’t seem to have a separate name…but don’t let that put you off. With a truly wonderful view overlooking the Old Town harbour, it’s a spacious outdoor cocktail lounge decorated in lots of white (chairs, sofas, tables). Cocktails are expertly made and the drinks list is extensive. Drinks here are on the pricey side, but they’re worth it just for that view. We were (unusually) served some cvarke as a little snack accompaniment – I think it worked, and couldn’t stop helping myself! (Cvarke are similar to pork scratchings that you get in the UK. The place to head to in Dubrovnik if you want to sample some of Croatia’s best wines, served by the glass. They also have plenty of other good quality wine from across the globe too. D’Vino holds wine tastings – which are very popular – where you can try glasses of different Croatian wines. However, you may also prefer to kick back and relax with a nice bottle or white or red and a delicious cheese or meat platter. Situated in the Old Town, just off Stradun, this rock pub has a laid-back vibe and an excellent beer selection. There’s live music on some nights. Right on Banje Beach (by day it’s a restaurant/bar), a short walk from the Old Town’s Ploce Gate. This is a lively club that stays open until the wee hours. Located in a fortress, this club is one of the most popular in Dubrovnik – with all the elements you would associated with a top club (spectacular lights and lasers, dancers and over the top cocktails). Attracts top name DJs and performers.